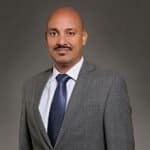 Rajesh Ranjan is a member of the Business Process Services (BPS) team and assists clients on topics related to market opportunity assessment, strategic engagement reviews, and next generation business process services issues. Rajesh’s responsibilities include leading Everest Group’s overall BPS syndicated and custom advisory services. To read more, please see Rajesh’s bio. One of my favorite quotes is “Disruption doesn’t discriminate.” And you’d have to be living under a rock if you hadn’t noticed the fundamental shifts taking place in the global services market due to digital disruption. We know that digital disruption is generally chaotic. It shakes up the existing business models, (likely destroys them), and paves the path for new ones. And it creates a set of opportunities not apparent earlier, while eliminating those we took for granted. Curse of Incumbency The rise of automation (especially RPA) is creating the biggest challenge for incumbents in their existing business model. Everest Group research shows that on a like-to-like basis, buyers are expecting the price per unit of work delivered in transactional BPS to reduce by at least 25-30 percent. If the incumbent shows reluctance, buyers are not hesitant to move the work to others. To put things in perspective, it means a USD $1 billion BPS company would see its base shrink by at least USD $100-120 million every year on an as-is base account basis (assuming an average five-year contract term, 40 percent of the portfolio will each year face pressure coming from renewal (20%) or a mid-term benchmarking (20%) situation). In reality, providers with the right approach and strategy will be able to mitigate this through scope expansion and new wins. Nonetheless, the pressure on an existing large book of business is tremendous. Benefit of Data As I highlighted in a blog last year, scaled-up providers are sitting on a treasure trove of data that is ready to be exploited and monetized from a benchmarking and associated analytics perspective. Some of the providers have started to make the right moves here. The next frontier is leveraging it for artificial intelligence (AI). One of the big challenges of making AI tools enterprise-ready is helping them learn fast. Injecting the AI tool with variety, volume, and contextual data is key to making this happen. Large incumbent providers are uniquely positioned to exploit this opportunity. Combined with their deep domain expertise, this can act as a powerful differentiator, and help them create significant value for their client, and, in turn, for their own business. Big is not bad. It is about identifying the digital disruption opportunities while managing the risks proactively. Speaking of size, my next blog will discuss what sized providers seem to be well positioned to exploit the opportunities created by digital disruptions. Stay tuned. Great goldmines lie hidden in large BPO providers’ backyards. A few clever ones have just started digging up fortunes. Some are, quite unfortunately, dragging their feet or blaming their tools. Most others are sleeping on tons of buried treasure, possibly not even aware of the magnitude of loss due to inaction. The gold is data. BPO providers have long had access to their clients’ actual data. However, like buried gold, the data’s potential has never been exploited enough. Most providers use basic reporting and simple descriptive analytics to provide visibility into the client’s internal operations. The more advanced ones have invested in predictive and prescriptive solutions. But, even these providers have only skimmed the surface of the real treasure. We are talking here of an aspect of analytics that has huge potential but has not received the attention it deserves from BPO providers – benchmarking. Currently, the multi-billion dollar benchmarking industry is mostly based on data collected through surveys or other secondary media. Such media are inherently prone to errors of omission and commission on the part of the participants, which directly impacts the accuracy of data that goes into the benchmarking analysis. Moreover, the volume of data with at least the smaller players in this industry is, in many cases, not large enough to ensure statistical significance. Perhaps most importantly, benchmarking service providers struggle to obtain the right context of data, which makes apples-to-apples comparisons difficult. Any organization with data that trumps that of the benchmarking providers in terms of accuracy, volume, and context is well-poised to disrupt this large industry. Now, here come the billion dollar questions. What if the BPO majors with large portfolios of sizable clients start thinking bigger? What if they realize that their data is more accurate (as it is their clients’ actual data,) more voluminous (as they have a continuous flow of data of hundreds of enterprises,) and more contextualized (as they have high visibility into the processes that generate the data) than that of the benchmarking industry? What if, after realizing the value of their goldmine, they use the data not just for internal analytics for a particular client, but also to provide benchmarking analytics by combining data from multiple clients? What if they go whole hog and start offering benchmarking services apart from their usual BPO services? And finally, what if they combine this data with big data to unlock the true potential of predictive and prescriptive analytics? The answers will determine whether the BPO majors are ready to let go of inertia and wake up to their true potential. To be fair, a few providers have taken steps in the right direction. The first example that comes to mind is ADP’s analytics. Its technology is powered by actual payroll and HR data of many of its North American clients. Perhaps the most powerful feature of its tool is compensation benchmarking. Currently offered only to BPO clients, this feature uses data on actual salaries paid to employees by its thousands of customers to arrive at pay benchmarks. Used to its full potential, this offering can be the stuff of nightmares for the incumbents in the lucrative compensation benchmarking industry, such as Aon Hewitt and Mercer. The common argument put forth by naysayers of BPO providers’ benchmarking potential is that such use of data would constitute violation of client confidentiality. The fact is that client confidentiality can be ensured almost exactly the way it is done currently in the benchmarking industry – by sanitizing data so that actual entities cannot be recognized. As long as legal frameworks allow repurposing of anonymized client data, this argument against benchmarking is surmountable. Of course, an effort to obtain the customer’s buy-in is imperative. This can be through inclusion of security and confidentiality standards in SLAs, and through proper incentives including offers of pro-bono benchmarking services. The other important imperative for providers is to ensure they make the right investments in talent, process, and tools with respect to benchmarking services. Indeed, providers looking to harness the full potential of these services by offering them stand-alone may want to consider creating an organization separate from their BPO services. What providers averse to the idea of benchmarking fail to realize is the opportunity cost associated with not letting the world know the potential of the data they have. For example, how did WhatsApp, which generated US$ 10.2 million in revenue in 2013, get acquired for US$ 22 billion in 2014? Answer – the potential of data. How did LinkedIn, which made US$ 2.9 billion in 2015, get a valuation of US$ 26 billion? Answer – the potential of data. BPO providers are letting themselves be grossly undervalued by not looking at benchmarking as a possibility. And we are talking here specifically of the scaled-up BPOs that have the threshold of data in one or more BPO segments required to deliver benchmarking services. It is high time that these providers realize they are sleeping on a goldmine and get moving on developing benchmarking offerings. Those that do stand to take their enterprise values to whole new levels. The global third-party BPS industry has evolved rapidly over the past decade or so, in breadth and depth of services. What started as largely a cost optimization play focused on non-core back-office business processes today has expanded to encompass the entire business process value chain supporting a wide variety of business objectives, including agility, flexibility, compliance, and improved business outcomes, among others. With that evolution has come growth – the BPS industry today is valued at about $150 billion – and, as you might anticipate, interest among service providers from a broad range of backgrounds and heritages. In fact, Everest Group estimates that there are more than 200 service providers with more than US$50 million in revenues around the globe, some pure-play BPS providers, some that offer BPS as part of a broader portfolio, some focused on a particular domain or geography, some broad-based. Yet, with all that expansion, what’s lacking in the industry are reference points to identify and compare the largest providers by size globally. Until now. Everest Group is unveiling our first ever BPS Top 50 to fill this gap. With this list, enterprises can now identify the largest providers and their functional coverage. Service providers can now compare themselves against others in the industry. In the coming years, all industry stakeholders will be able to understand the broad dynamics of the growth and success in the industry. This week we heard that Capita and Xchanging had agreed on the terms of a recommended cash offer of 160 pence per share. The offer values Xchanging at approximately £412m. If it goes ahead, the acquisition would be Capita’s largest ever; it is 260% bigger than its previous largest acquisition, that of avocis for £157m in February 2015. Capita’s newly found appetite for larger acquisitions marks a noticeable change in approach between the current CEO, Andy Parker, and his predecessor, Paul Pindar. While Pindar went for niche acquisitions, Parker is going for accelerated inorganic growth. Significant leg-up in Insurance BPO: Xchanging is something of a jewel in the insurance sector due to its golden relationship with Lloyds of London as well as insurance sector specific technologies such as Xuber. Insurance services accounts for the larger part of revenue at circa 60%. For some time now Capita has been talking about growth in the insurance sector, setting the scene for more of its M&A activity. It has previously stated, “Where premium growth remains modest, (insurance) firms are focused on improving operational efficiency and organisational flexibility, areas Capita is well placed to help them address.” Before it made the offer for Xchanging, Capita had expanded its insurance capabilities through the acquisition of SouthWestern. This brought it 700 skilled, multi-lingual FTEs at two sites, Krakow and Lodz, providing services to insurance, finance and legal administration, and customer management across Northern Europe. Another relevant and recent acquisition was that of tricontes in 2014. The £6.2m acquisition of the Munich-based company in June 2014 brought Capita specialist contact centre services for various sectors including the insurance sector in Germany. Bigger play in the private sector business: The split between Capita’s public and private sector business has always stayed roughly around 50:50 with annual variations of plus or minus 5%. In 2014 Capita’s private sector business was £2273.6 and accounted for 52% of revenues. With revenues of £406.8m in 2014, Xchanging could boost Capita’s private sector business by as much as 18% – a significant growth. Entry into potentially lucrative BPO segments: Xchanging has good capabilities in the fast growing Procurement Outsourcing (PO) and Capital Markets BPO. Our analysis shows that both market segments are growing upwards of 10% CAGR. Further, these are specialized BPO segments and hence less prone to commoditization. However, to fully capitalize on the potential, Capita would have to address recent issues with Xchanging’s PO business. Geographic diversification: This acquisition would help Capita expand its market presence beyond the UK. Some of the key countries where it could help Capita are Italy, Germany, and the U.S. While the scale may not be big, it can provide Capita a base upon which to build its international business. Further, continental Europe is a specialized market, which may not be the easiest to penetrate for an external service provider. Xchanging, with its multiple contracts in Germany, can help Capita in its entry in that geography. Greater global sourcing leverage: Capita has around 5,000-6,000 FTEs in offshore location. This acquisition offers the potential of increasing this number by 20-25% primarily in India. Clearly, this acquisition can help accelerate Capita’ growth and capabilities in multiple ways. However, as with any acquisition, successful integration will be key to harness the potential including effectively addressing recent issues. Capita is not the only service provider to be eying growth in the insurance sector. With this bid, Capita’s acquisitive culture is set to give it an edge over the others. We regularly make small adjustments to our PEAK Matrix™ assessment methodology – minor tweaks to fine-tune our approach to align with market evolution. This year, however, we have decided to undertake a more comprehensive modification to the assessment. Why mess with a good thing? To make it even better and more relevant. In particular, we’re making changes to keep pace with the rapid evolution of IT and business process services, particularly as innovation, intellectual property (IP), digital, and technology-driven solutions take center stage in the delivery of these services. While our fundamental principle of using a fact-based assessment remains core to our methodology, we are enhancing our PEAK Matrix assessment methodology in three principle areas. Maximize IP and innovation. We are recognizing the rising value of IP and innovation in global services by significantly increasing the weighting assigned to them. Of course, IP and innovation have always been a part of the PEAK Matrix Assessment, but their status will rise in the assessment, as has their significance in the global services market. Eliminate FTE count. At the same time, we are eliminating FTE count as an assessment dimension altogether. As technology increasingly fills the roles FTEs had managed in the past – at lower cost and often better outcomes – the size of a provider’s delivery talent pool has become irrelevant. Minimize scale. The provider’s overall scale – a combination of financial strength and focus on the service area being assessed – will remain as part of the assessment, but will decline in importance in the evaluation, making room for innovation to take on a larger role. Together, we believe these changes assure that our assessment framework continues to be aligned with the emerging and future direction of the global services market. We expect these changes to have a couple of implications for service providers. First, those providers that bring innovative programs to their clients will be recognized for their efforts – and expense. Furthermore, overall scale will have less impact on the providers’ ratings, assuming they demonstrate high levels of innovation and good business outcomes. The recipients of these services, the enterprise buyer, will have a much clearer view of each provider’s ability to deliver innovation and outcome-oriented solutions. And they will gain insights that will help them better understand how service providers’ capabilities align with future objectives. As the dynamic global services industry evolves, we will continue to make adjustments to our PEAK Matrix assessment methodology – some minor, some major – to ensure that it retains its universal relevance and value. Because sometimes messing with a good thing is a good thing. While robotic process automation (RPA) is creating opportunities for the newer breed of service providers, their more established competitors are feeling the pressure of change. RPA would cannibalize the established service providers’ labor arbitrage business which they have invested in for decades. At an initial estimate, we see a phenomenon of 40-40 emerging which means 40% of existing BPS work is likely to get impacted by RPA with a 40% lower cost impact. Free of this legacy, newer service providers can ride the wave of automation to gain market share quickly. Cannibalization is not the only threat to established vendors. The RPA disruption has coincided and in part fuelled the current trend for anti-incumbency. In 2013, for example, Everest Group research shows that over half of Finance and Accounting Outsourcing (FAO) contracts were taken away from the incumbent provider when they came up for renewal. In this market the newer breed of service providers could be seen as agile and unencumbered by legacy investments in labor arbitrage. However, established providers are also upping their game and this means it will likely be a buyers’ market in the mature BPS segments. The newer breed of service providers are those which have either focused strategically on RPA as a growth engine (and have limited legacy non-voice BPS business), or which have been newly established as pure-play RPA-based service providers. Let’s look at the one illustrative provider in each of these two categories respectively – Sutherland Global Services and Genfour. Sutherland Global Services (SGS), a leading contact center player, is arguably one of the first service providers to strategically focus on RPA as well as actively market it for the non-voice BPS space. It has made automation a key part of its proposition and is leveraging it to differentiate itself from other service providers that either rely heavily on offshore resources or global majors that can implement automation through major transformation and system integration projects. This strategic focus has led it to develop partnerships with RPA technology providers such as Blue Prism. It has also seen the company develop its own RPA software layer which links to and supports third party automation technologies. Another key capability that SGS has developed is a 24×7 control tower, which maintains existing automations to ensure continuous operations. SGS refers to a recent contract win as a sign that its focus on RPA is paying off. As part of the RPA-led BPO deal with an European travel company, it is taking over two operational centers in Scandinavia and Estonia. It already has circa 400 people in Sophia delivering transactional and front-office services. The largely U.S. based service provider will leverage the additional delivery centers to grow in Europe. That growth, according to SGS, is going strongly with annual targets reached and exceeded part way through its financial year. Other RPA-led deals are in the pipeline. We believe, as a relatively newer service provider in the non-voice BPS space, SGS is transitioning to a mostly automation-enabled provider in the back- and middle- office. We estimate that automation currently accounts for 10%-15% of its FAO & middle-office services but is rising fast. Genfour was founded in 2012 to offer a different way of providing back-office services. Today it offers Robotics as a Service, on a cloud-based infrastructure on-demand. The proposition to lower costs is strong given the benefits of automation combined with a cloud infrastructure. Its challenge is to win over skeptics that do not yet believe that robots can do as good a job as people in delivering business processes. Genfour also offers consultancy, development and on-going run operations. It has gained six clients since it was established and these include organizations such as NHS Scotland, IFDS, Coral and RAC. Genfour is building an annuity-based business model where, not only does it generate revenue from the reselling of robotic software but also from managing every robot that it operates on behalf of its clients. It is already achieving a high operating margin for a business process service provider at 22% in H1 2014. This is set to stay at 20% to 21% full year. Both SGS and Genfour see the use of automation as a good fit to the increasing buy-side appetite for transaction or outcome-based pricing instead of the input/FTE-based model. Genfour started out with its “as a service” model while SGS is in a transition state. It is offering banded pricing using virtual FTEs and some blended pricing where people and robots are mixed. Anti-incumbency provides opportunities for the newer breed of service providers which could be seen by potential clients as agile an unencumbered by legacy investments. However, these service providers will have to have the ability to scale services and offer slick switching processes if they target contract renewals. Competition is intense in the market with established service providers making investments to optimize and streamline the switching process. For example, multiple service providers have developed specialized transition management solutions to streamline switching and subsequent transition. There has been a great deal of buzz about RPA in the market recently. This is making established service providers increasingly highlight their own automation capabilities and make new strategic alliances with third party automation software vendors. Examples include EXL, Infosys and Steria which have been largely using their own automation tools. In addition, some such as Steria and Genpact, have also set up partnerships with third party software vendors (e.g. Blue Prism & Automic). These and others will be looking to narrow the gap in mindshare between themselves and the new generation of service providers which have gained market share through strong messaging and strategic use of RPA. Buyers are increasingly becoming focused on higher-end value proposition. They are willing to switch to a new provider, in case the incumbent is unable to deliver value beyond just labor arbitrage and basic process efficiency. Established service providers that are building on their RPA capabilities will be looking to make up for cannibalization of revenue by opening up new higher value opportunities such as analytics services. RPA can help them reduce internal costs too. Apart from helping the bottom line, given anti-incumbency, this would enable them to more easily absorb the cost involved in clients switching. Everest Group will be publishing a report on Service Delivery Automation (SDA) shortly. It will be discussing the findings of the report at its half-day Robotic Process Automation event for buy-side clients in Dallas on October 22nd. Review the agenda and request an invitation. Watch out for forthcoming research reports from Everest Group on anti-incumbency, analytics, and technology / automation in the BPS space for a deeper-dive into these dynamics. In the earlier days of the recruitment process outsourcing (RPO) and broader talent management services industry, partnerships between providers as a means to deliver enhanced service offerings and greater geographic coverage were common. Yet, in the past couple of years, many of these partners have taken the M&A path in response to increasing buy-side desire for consistency and standardization in their recruitment operations. The Pinstripe/Ochre House merger – announced on July 18, 2013 – certainly plays to the market’s preference for a single provider model. Yet, in their case, the drivers extended beyond buyers’ preference for a single provider model, complimentary capabilities, and a time-tested partnership construct. In fact, Pinstripe could have faced serious client, potential new business, and time-to-market losses had it not taken the merger route. For more details on the merger and its impact on the market – both buy-side and sell-side – please see Everest Group’s breaking viewpoint, Pinstripe Merges with Ochre House: Demise of Partnership-Based RPO Model. Talent is clearly the true differentiator in the 21st century. Having the right talent at the right time and in the right place is even more paramount in the current economic situation. However, organizations will need to understand the megatrends impacting the talent market, including the demographic shift, generational differences, globalization, and changing workplace requirements and expectations. Organizations need to align their talent acquisition strategies to remain successful in the long run. The success of recruitment process outsourcing (RPO) in creating value for buyers is evinced by the rapid growth of this market over the last few years. The RPO market has reached $1.4 billion in annual contract value (ACV) in 2011, and the market is expected to continue on a high-growth trajectory. RPO has the potential to create value and impact at three levels: cost, business, and strategic. In the early stages of RPO (RPO 1.0), it addressed the cost and the business impact considerations focusing on elements that are low hanging fruits and easy to measure and quantify. The next generation of RPO (RPO 2.0) addresses the cost and business impact on a holistic basis and also starts to create strategic benefits for organizations. It calls for taking a comprehensive approach to talent acquisition—inclusion of internal and external hire management both as well as wide process inclusion—in particular and talent management in general. It requires identifying, impacting, tracking, and measuring more strategic metrics that are business-outcome oriented.